Garden in the center of the inn. At night Noh performers appear on the garden's stage in the glow of the torches. The lobby where guests are welcome to help themselves to a cup of complimentary coffee or tea. 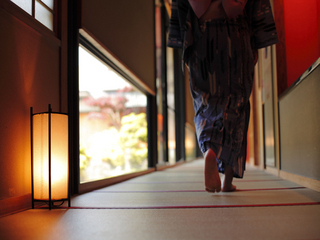 Tatami mats (traditional Japanese straw mats) extend to the end of the corridor in the modern Japanese style building. Example course. 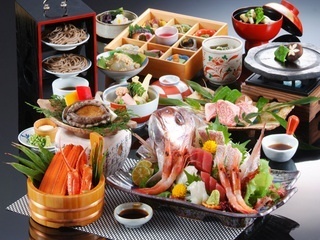 The special dishes served between April and October, Ayatori Banquet. 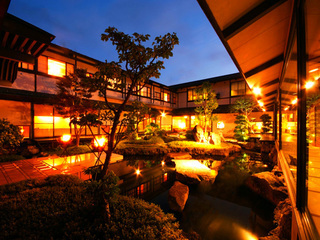 From our open-air hot spring bath guests can enjoy the changing seasons and the spirit of Japan. 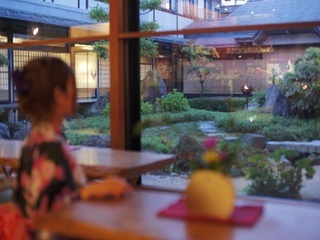 All plans include free admission tickets to the public hot spring baths. Free shuttle service to and from the public hot springs available 4pm~9:30pm. Choice of Yukata(cotton kimono)-rental fee JPY1,000. Massage and esthetic concierge(extra charge). Modern Japanese tea-ceremony arbor styled building. Relaxing view of the central garden from the lobby. 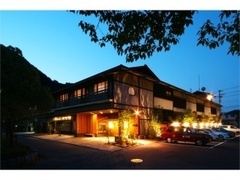 Tatami matting extends throughout the entire building. Gender segregated large public baths, stone open-air bath, sauna and jacuzzi also available.